It is The Year Of Warhammer, as decreed by the ancient texts that promised Dawn of War wouldn’t be the only good Warhammer game, one day. Vermintide, set in the fantasy version’s End Times period when everything went to the warp in a handbasket, arrived a little early to the party, but no less good for it. Now it’s expanding with its second paid-for DLC, Drachenfels, adding three new maps to the rat murder-spree. Itching to shoot something, but rats proving too easy a target? Here’s the best FPS games we’ve played. The titular castle Drachenfels, quite the spooky joint now filled with rats. The Dungeons of said castle, packed with traps. These traps will randomise each time you run the map, necessary in the multiple-play world of Vermintide. You’ll also need to use a new light mechanic based around torches to explore the pitch-blackness. Summoner’s Peak, a rat-infested mountain where they little beasties are summoning reinforcements from their dark gods. You should probably stop them. 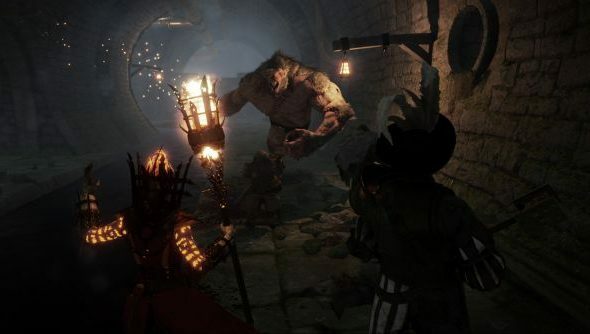 You’ll be able to play all three come May 26, though Fatshark are yet to reveal a price for the pack. The previous DLC, Schluesselschloss, goes for £1.99 / $2.99 on Steam but only included a single map and no major mechanic introductions. There have also been a pair of free updates of similar size.